Curtis James Jackson III (born July 6, 1975 in South Jamaica, Queens, New York), better known by his stage name 50 Cent, is a Grammy award nominated rapper, actor, singer, entrepreneur, author and founder of the hip hop group and label G-Unit. After leaving drug dealing to pursue a rap career, he released his debut album Guess Who’s Back? in 2002. He was discovered by Eminem and Dr. Dre and then signed to Interscope Records. 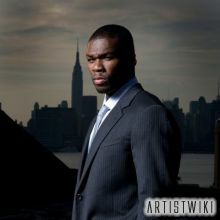 He has since released 2003’s Get Rich or Die Tryin’, 2005’s The Massacre, 2007’s Curtis and 2009’s Before I Self Destruct.